SAP just launched SAP S/4HANA Cloud 1611 yesterday. You can check out my blog which summarizes the insights and highlights at a glance. In this blog I will focus on the SAP S/4HANA Finance Cloud, which is now available with the SAP S/4HANA Cloud 1611 release. As you can see in the picture below, Finance Cloud is built as the center of a modular Cloud Suite. This means that you can start your journey in public cloud with a modern digital finance solution, and evolve based on your company’s needs and strategy. S/4HANA Finance Cloud doesn’t only support the Finance Department, but also the surrounding processes that lead to financial booking such as basic sales and procurement processes. It also integrates with other SAP solutions like SAP SuccessFactors, SAP Ariba, and SAP RealSpend, a finance solution running on SAP HCP (Hana Cloud Platform). Finance Cloud is a starter ERP including of course Core Finance functionalities like universal journal or soft close, and in addition Order-to-Cash and Procure-to-Pay processes are covered. With this, S/4HANA Finance Cloud is the go-to solution for the upper-middle market to start getting into public cloud. 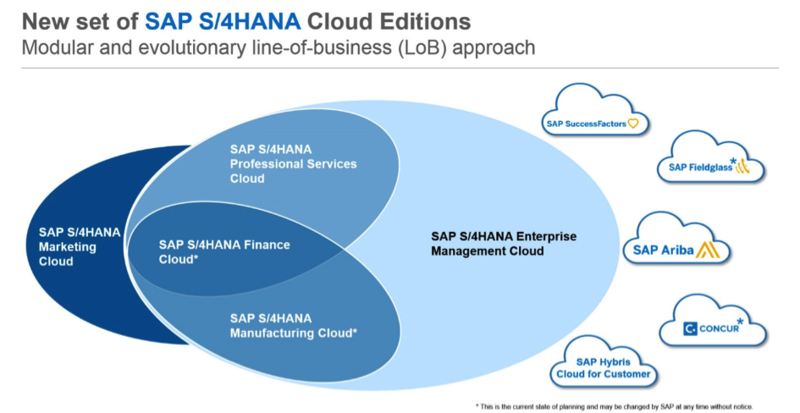 What makes S/4HANA Finance Cloud unique? Through a universal journal a single source of truth across financial and managerial accounting is being created, which drastically reduces the memory footprint by eliminating pre-calculated aggregate tables and enables on-the-fly aggregation and segmentation of data. SAP S/4HANA Finance Cloud reduces reconciliation need significantly. This means that end-of-period batch activities are reduced and a “soft close” is possible anytime. With the simplified Cash Management operations, real-time cash position with embedded and KPI-based analytics can be evaluated and managed easily. The award-winning SAP Fiori designs improves the user experience of SAP S/4HANA Finance Cloud and provides a responsive, intuitive, and role-based experience across desktop, tablet, and smart phones. A key component of the SAP S/4HANA Finance Cloud is a pre-delivered HR integration with SAP SuccessFactors. Across both solutions new intelligent services are introduced, leveraging the power of machine learning and intelligent workforce to transform self-services to intelligent and predictive services.